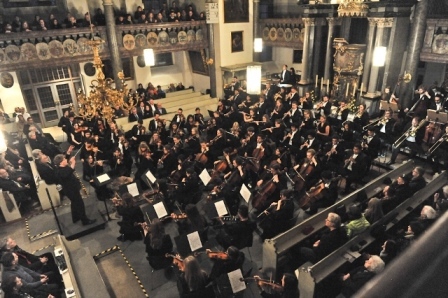 On Easter Monday, the large symphony orchestra gave its traditional symphony concert in the Max-Reger-Halle Weiden. The young musicians from more than 30 nations presented themselves with one of the most monumental symphonies of Romanticism, the 5th Symphony by Anton Bruckner. The symphony impresses not only with its tremendous temporal extent, but especially through the exquisite beauty of delicate melodies in combination with brilliant increases and submerged in the sound-noise sections.